A recent survey conducted by CIRP, asked consumers who activated smartphones from June through August which type of phone they used and from what carrier. The operating system breakdown looked something like this: 48% Android, 28% iPhone, 17% feature phone, 4% Blackberry, and 1% Windows Phone. The shocking number there is that of feature phones, which is more than triple Windows Phone and Blackberry share combined. Yikes. I’m actually hoping that Windows Phone starts to catch on, as the operating system is a joy to use. It’s also good for competitive and driving innovation. 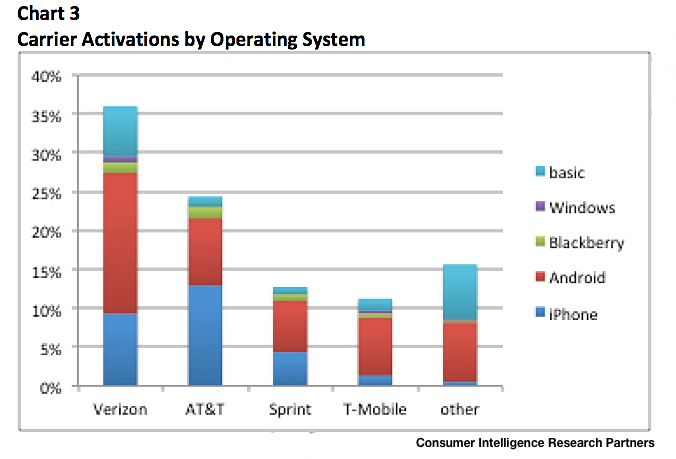 As far as a carrier breakdown goes, Android was the top dog at Verizon by a mile, with feature phones and iPhones battling it out for 2nd place. AT&T was the opposite, and is clearly still a pro-iPhone carrier after having an exclusive deal for years. It’s tough to predict if their iPhone vs. Android numbers will start to level out now that they are carrying better Android phones and because Verizon and Sprint are selling the iPhone. Only time will tell. No matter what, Android is still sticking around as the domestic and global leader. There are far too many options at each price point for it to slow down any time soon.